From a very young age I started drawing. Copying the cartoonistic portraits of political leaders in the newspaper. 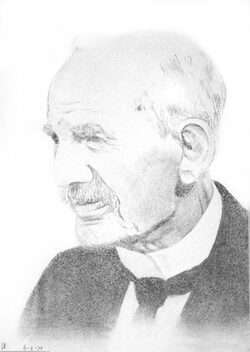 Here you see an old charchoal drawing I made at age 16 of my greatgrandfather, a school headmaster. ted, out of sheer curiosity, to enter art academy. And what a surprise it was, to hear that I passed the entry exams! y family. I'd become the mother of two great kids and in those days I was happy to even be able to do some computer designs. It's only years later that I felt I wanted to pick up art professionally. I had also lived in Surinam for a while where I wrote a paper on the cultural influences on artistic development and expression. Back in Holland I graduated as a teacher of visual arts using the results of this study. In 2011 I decided to quit my administrative job to work as an artist in my own studio in Helmond. Soon after, people started asking me for art classes and I founded Artschool Helmond. Every day I thank God for my artistical and personal freedom. I give workshops in streetart, graffiti, group paintings megapainting and childrens' graffiti parties. Companies hire me to do murals and besides the painting classes I teach, I use my time and space to focus on my own artistic development. which might be even more important. I am looking forward to all new challenges, new projects and new people to portray. Let me know what, or who you'd like me to paint. Portraits, landscapes or abstracts, I will surely give it my very best shot! So let me hear from you! The mediums I work with differ, depending on the subject; it could be acrylic paint, graffiti sprays, watercolour, wax, paper, cement, glue, collage, monoprint; there are no boundaries. So, for a portrait I just need the photo's you send me! Check out the galleries and if you like my work, feel free to call or mail to find out how I can help visualise your dreams.